Clough et al. (1965) proposed a macro-model using a two component element (an elasto-platic beam + a linear elastic beam) combined in series to represent a vertical element (wall or column). This model, however, could not represent strength or stiffness degradation in cyclic loading. A one component macro model using a single element with lumped hinges at each end was proposed by Giberson (1967). It is assumed that the nonlinear deformations are lumped at the ends of elements and elements deform in double curvature. Different hysteretic rules were assigned to these one or two component elements to account for degradation in cyclic loading. The Three Vertical Line Element Model (TVLM) proposed by Kabeyasawa et al. (1982) used two vertical springs to model the boundary elements, while a central multi-spring element is used to model rotational, shear and axial deformations of the wall. The TVLM was later extended by Vulcano (1988) to the Multiple Vertical Line Element Model (MVLM), where multiple vertical elements were used to represent different sections of the shear wall web. The model is reported to successfully represent important behavioural features of the shear walls. Orakcal et al. (2004; 2006) investigated the application of the MVLE model to model key response parameters associated with cyclic response of flexural walls. Vecchio (1999) proposed a finite element algorithm for modeling shear walls. This model uses a rectangular mesh, and incorporates the nonlinear material characteristics of the concrete and steel. The potential effect of slip (bar extension) at the base was not taken into account. The model provided good predictions of the responses of walls. Belmouden and Lestuzzi (2007) studied the performance of RC walls using an inelastic multilayer flexibility-based finite element with multilayer interfaces (similar to fibres). The hysteretic behaviour of the walls including strength and stiffness degradation, pinching and potential effect of slip was modeled. Inelastic shear deformation mechanisms and confinement effects were also explicitly modelled. The models were in good agreement with experiments carried out on slender walls. The application of fibre sections assigned to beam-column elements is becoming popular in modeling shear walls to predict the nonlinear response. 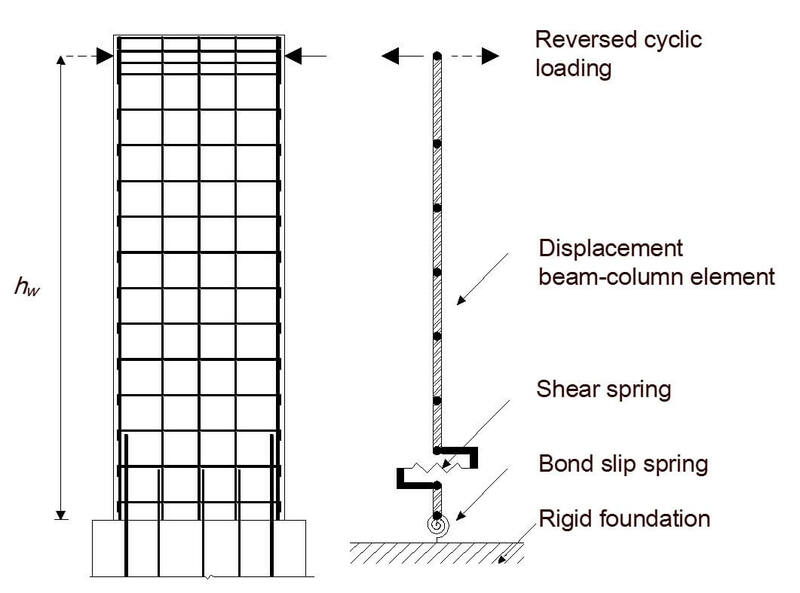 NIST-GCR10-917-8 (2010) describes the application of this approach for modeling different shear walls (either flexural or shear dominated). These models are able to accurately capture global responses of the walls, and are easy to use for engineering purposes. These fibre elements have been recently implemented in commercial programs (SAP2000, 2011; Perform 3D, 2010). Different behavioural features such as the effect of potential bar extension at the base of the walls and the presence of the lap spliced bars in different locations of the walls have been studied by researchers. Cho and Pincheira (2005) have studied the effect of lap splice length on the stress that could be developed in the lap spliced bars. The model is modified and implemented in the current edition of the ASCE/SEI 41 (2006) document. The potential impact of bar slip is also studied by many researchers (Belmouden and Lestuzzi, 2006; Massone et al., 2009). Zhao and Sritharan (2007) proposed a fibre-based nonlinear element in order to account for potential bar slip at the base of walls and columns. Clough, R. W.; Benuska, K. L; and Wilson, E. L. (1965). “Inelastic Earthquake Response of Tall Buildings” Proc. 3rd World Conference on Earthquake Engineering, New Zealand. Giberson, M. (1967). The response of nonlinear multi-story structures subjected to earthquake excitation. Tech. report, Earthquake Engineering Research Laboratory, California Institute of Technology, Pasadena, California. Kabayesawa, T. H., Shiohara, S., Otani, S. and Aoyama, H. (1982). Analysis of the Full-Scale 7-Story R.C. Test Structure. Proceedings, 3rd Joint Technical Coordinating Committee, U.S. Japan Cooperative Earthquake Research Program, Building Research Institute, Tsukuba. Vulcano, A., Bertero, V. V. and Colotti, V. (1988). Analytical Modeling of RC Structural Walls. Proceedings, 9th World Conference on Earthquake Engineering, V. 6, Tokyo-Kyoto, Japan, 41-46. Orakcal, K., Wallace, J. W. (2006). 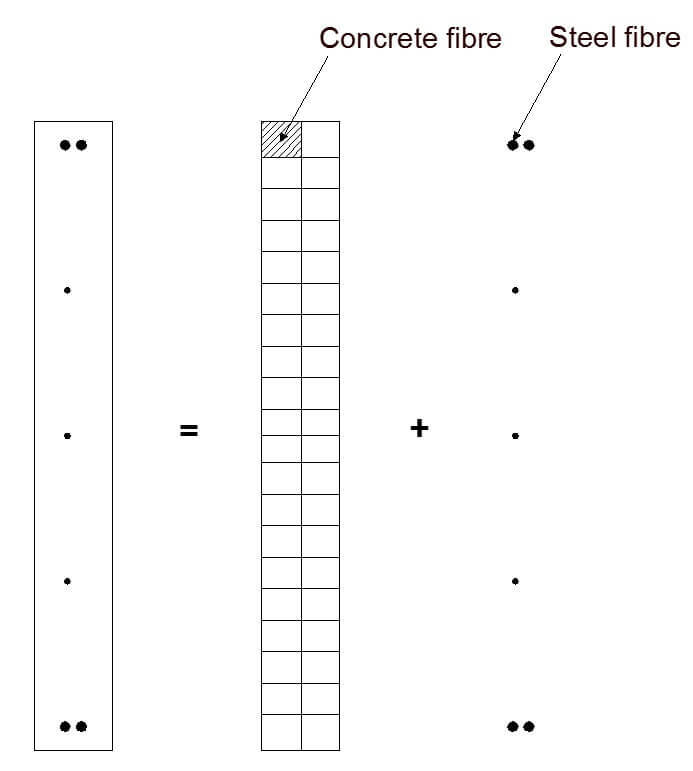 “Flexural Modeling of Reinforced Concrete Walls-Experimental Verification”. ACI Strcutural Journal , 103 (2), 196-206. Orakcal, K., Wallace, J. W., Conte, J. P. (2004). “Flexural Modeling of Reinforced Concrete Walls – Model Attributes”. ACI Structural Journal, 101 (5), 688-698. Belmouden, Y. and Lestuzzi, P. (2007). Analytical model for predicting nonlinear reversed cyclic behaviour of reinforced concrete structural walls. Journal of Engineering Structures 29:7, 1263-1276. NIST, 2010, Evaluation of the FEMA P-695 Methodology for Quantification of Building Seismic Performance Factors, GCR 10-917-8, prepared by the NEHRP Consultants Joint Venture for the National Institute of Standards and Technology, Gaithersburg, MD. ASCE/SEI 41 (2007). “Seismic Rehabilitation of Existing Buildings”, American Society of Civil Engineers, Reston, VA.
Massone, L.; Orakcal, K. and M., Wallace, J. W. (2009). “Modeling of Squat Structural Walls Controlled by Shear”. ACI Structural Journal, 106 (5), 646-655. Zhao, J., and S. Sritharan. (2007). “Modeling of strain penetration effects in fiber-based analysis of reinforced concrete structures.”, ACI Structural Journal, 104(2), pp. 133-141. This entry was posted in Inspection and Evaluation and tagged Concrete. Bookmark the permalink. ← Why and When to Use Concrete Piles?